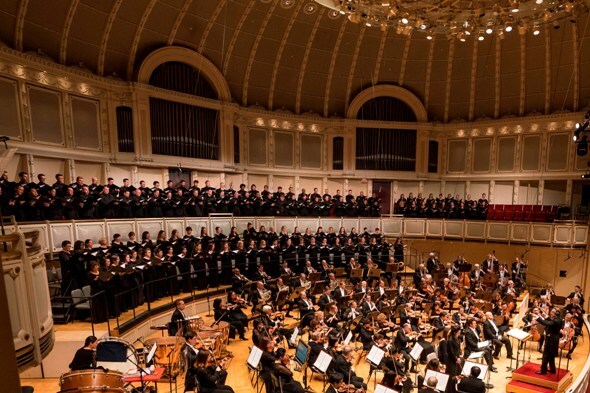 Review: Chicago Symphony Orchestra and Chorus, Riccardo Muti conducting, in Verdi’s Requiem Mass, through Nov. 10. When communities seek to bring people together after violent conflict or catastrophe, Verdi’s cathartic Requiem Mass is often given. 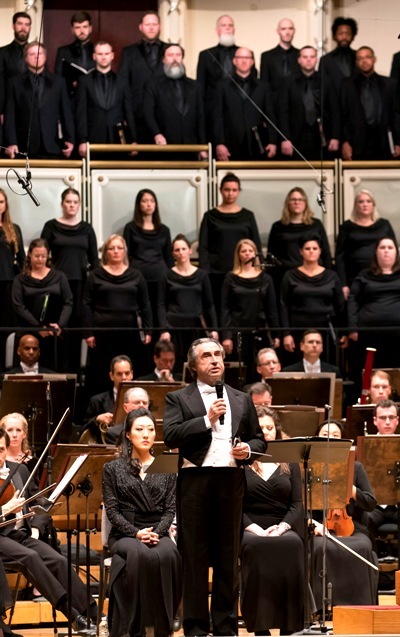 The Verdi Requiem was already scheduled for performances by the Chicago Symphony Orchestra and Chorus when 11 worshippers at Pittsburgh’s Tree of Life synagogue were gunned down on Oct. 27. And the work had been further rehearsed by music director Riccardo Muti and cued up for Nov. 8-10 concerts when sudden disaster struck Nov. 7 at California’s Borderline Bar & Grill, a lone gunman’s rampage on a college kids’ country music night that left 13 dead and many more injured. “As a citizen of the world and a father and grandfather,” Muti asked for the audience to acknowledge recent tragedies in a moment of silence. 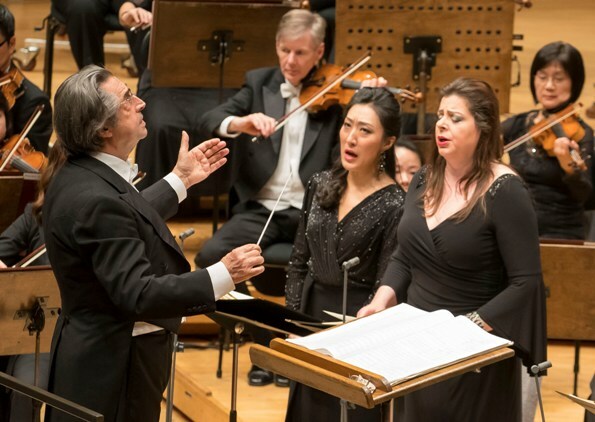 Muti’s first act at the opening performance was to acknowledge that he and his musicians and singers could not present this mass for the dead “without thinking of the young people and old people who were killed in such a tragic way.” Brahms’ Requiem offers consolation for the living, but Verdi’s purpose is “to ask for peace,” Muti added, expressing his own concern, “as a citizen of the world and a father and grandfather,” that the lack of cultural and spiritual values in today’s world is one of the causes of such upheaval. He then invited the audience to stand for a moment of silence before the onset of Verdi’s own deeply felt – and startlingly direct – appeal for deliverance from the wrath, misery and ruin the Bible foretells. While many conductors approach Verdi in broad strokes, Muti surprised with ravishing, dramatically specific solutions reflecting details of the text and subtext. The Requiem opened with muted cellos whispering a surpassingly beautiful melody in unison – graceful, diaphanous, transcendent. As more strings and then choral voices joined in at the threshold of audibility, the sound seemed to soften and spread; one’s ears were like eyes becoming gradually accustomed to light. Soon the ominous “Dies Irae” began with the deafening crack of the orchestra’s precision hit, which seared like lightning as the chorus exclaimed about the End of Days, when the world will burn. (David Herbert and Cynthia Yeh, whacking away at timpani and two giant bass drums like demon drummers, provided elemental percussive fury.) These were the unforgettable extremes. But while many conductors approach Verdi in broad strokes, Muti surprised with the density of his ravishing, dramatically specific solutions reflecting the text, and often the subtext, in rich detail. 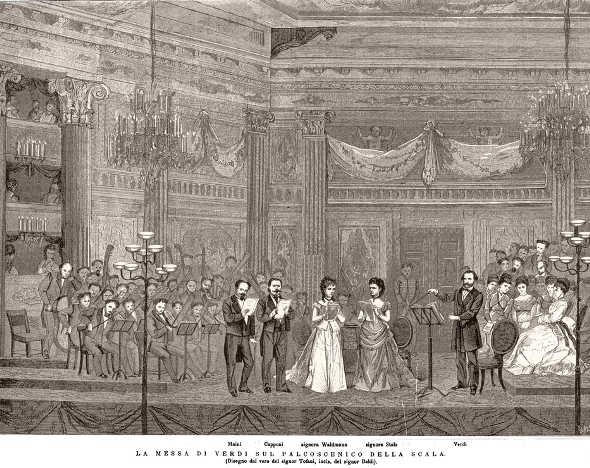 One can easily understand how American musicians, for whom Italian is a foreign language, might look at Verdi’s scores and see repeated patterns underneath the vocal line that look like so much endless noodling accompaniment. 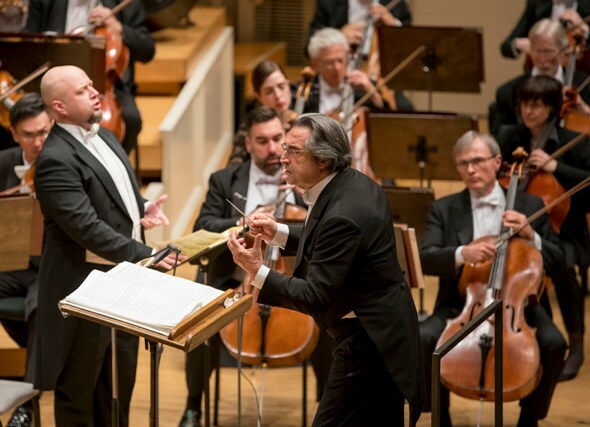 Indeed, orchestras in opera pits do often disengage if the conductor lets them, but Muti’s magic starts with his enthusiastically involving everyone in the intricate specifics of what’s going on dramatically in every bar. Thus a single note’s musical expression becomes dependent entirely on what’s being said exactly at the moment – what the characters are thinking, what’s going to happen next. Orchestral and choral commitment to this effort is essential in underscoring the nature of that instant, or providing irony or mitigating context. The quartet of vocal soloists is not exactly identical to those who will tour to Asia – during that time tenor Piotr Beczala, who sang the Requiem with Muti in Vienna in 2014, will be at the Met. His “Ingemisco” came off as a tender aria of special pleading, reminding God that He had absolved Mary and listened to the thief, and therefore he also deserved to hope. “Mors stupebit” (Death and nature will be stupefied) sang the impressive bass Dmitry Belosselskiy, who has performed with both the CSO and Lyric Opera previously. Mezzo-soprano Daniela Barcellona and bass Dmitry Belosselskiy, both Muti regulars, seemed ideally matched and consistent throughout, a brilliant, steely blend, matched in their capacious reserves of strength and the musical wisdom in those generous arcs of phrase that blossomed at the top. Her “Liber scriptus” (A book of judgment will be brought forth) was opulent and stately, with a foreteller’s conviction of doom. His “Mors stupebit” (Death and nature will be stupefied) conveyed the short phrases with a sense of panicky anticipation, as Muti, taking this section faster than most, invoked an orchestra that seemed to tremble with shallow breath. Dramatic soprano Vittoria Yeo, whom Muti has been helping to develop, was joined by formidable mezzo-soprano Daniela Barcellona, the Dame Quickly in Verdi’s “Falstaff” with Muti in 2016. A newcomer, soprano Vittoria Yeo, who has been groomed by Muti for major roles such as Aida and Lady Macbeth on Europe’s summer festival circuit, was impressive in the hyper-emotional “Libera me” finale, begging for deliverance with almost savage urgency. I can see her holding a candle, sleep-walking, in a big opera house one of these days. 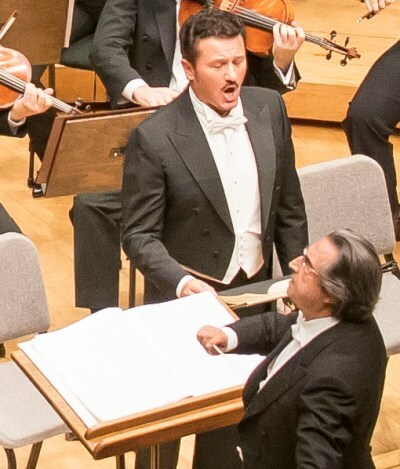 Piotr Beczala sang “Ingemisco,” the tenor centerpiece, as he did with Muti and the CSO on tour in Vienna in 2014. On opening night, the soloists’ ensemble singing in close harmony, always a treacherous challenge, became uncertain upon occasion. Given that final judgment was the topic at hand in the “Lacrymosa,” these tentative passages, in the context of the scenario of tears and mourning and begging for mercy, didn’t damage the suspense too much, although the music’s impact was lessened. Meanwhile, the impressive Chorus met the high standard of the amazing double chorus “Sanctus,” which is sung at a blistering pace toward the end of the Requiem, in a rare outburst of jubilation heading toward frenzy. Should a Deity be susceptible to the power of suggestion, one might suppose this highly persuasive singing of the last line “Hosanna in excelsis” is the sort of thing that would do the trick. Sitting far from the stage on this night was in no way a minus, the better to take in the trumpets, two by two, on either side of the choral rafters, for the glorious “Tuba mirum” (The trumpets shall sound) and the chorus itself, which stretched side to side on two levels, the majority of its singers seeming to need to glance at the scores but rarely. 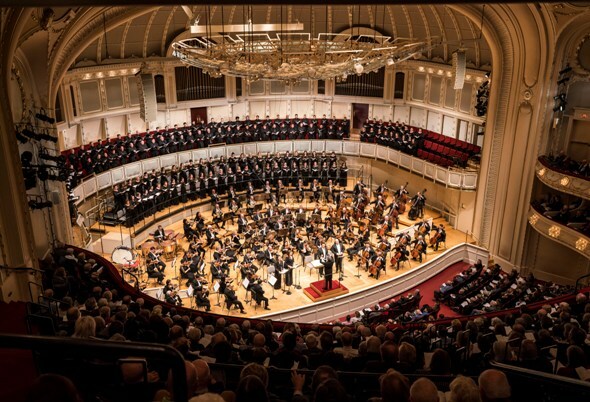 When the CSO tours to Tokyo in late January, Muti will perform the Requiem with the Tokyo Opera Singers Chorus. I understand the prohibitive expense that would be involved in taking the Chicagoans, and the Tokyo singers will enjoy a wonderful opportunity. Still, this chorus sounds so good that it’s a shame not to show them off.